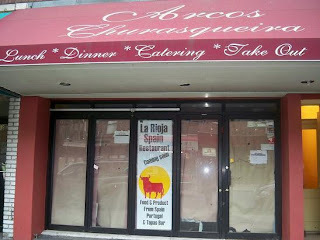 I noticed that the old Arcos Churasqueira is being replaced by a new tapas place called La Rioja. Very excited about this new addition, I think it'll complement Broadway's eclectic culinary offering of Greek, Thai, Italian, Japanese, Mexican and many other cuisines that I'm probably leaving out. The only other Spanish restaurant found in this hood is El Boqueron, which has received mixed reviews. I happen to love it but am looking forward to trying another option as far as Spanish and Portuguese food goes. I'll keep you posted about La Rioja's opening and a menu when I get it. We will definitely try it! my husband and I just got back from spain, and saw the new tapas place opening soon! cannot wait to hear all about it! love rioja wine and all the tapas, hope it resembles spain's tapas!!! keep us posted! Will definitely keep you posted. Last time I walked by (a couple of weeks ago) it was still closed. The place is now open. Went there on the weekend, the service still needs a bit of work, but the tapas were very delicious, although a bit pricey. I recommend the "patatas a la riojana", the "calamares a la plancha", and the "dates with bacon". Also, their selection of cheeses is great, and must have the "Jamon Iberico" (Iberian ham), very lean and delicious. The place still doesn't have a liquor license, but the waiters suggested that we could bring our own wine, which I immediately did. Oooh thanks Anon - glad to hear that it's BYOB. I'm so there! FOOD IS EXCELLENT!!!! TAPAS WERE DELICIOUS AS WELL AS THE PAELLA. I HIGHLY RECOMMEND IT. Awesome - can't wait to check it out. What are the prices like?